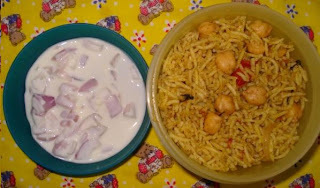 Today's Lunch box had my favorite Rice item - Channa Pulao. 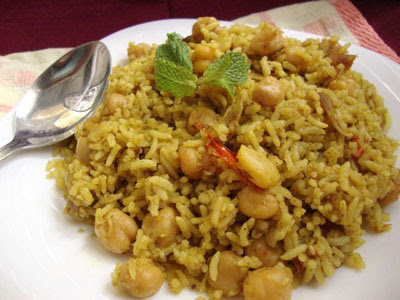 Channa Pulav is something that we must have prepared some 101 times, still every time we eat it, tastes like the first time we having it. Amma got this recipe from a newspaper cutting. It was during this time, I became more interested in cooking. It was also during this time, I found myself in the cross roads of life, everyone does I guess, and I was thinking what productively I can put myself to excel. I was lucky that I was able to distract myself with something useful. I have always been creative on mundane things which never bore me. I saw that Amma had collected so many recipe cuttings that she was always getting lost in finding what she wants. So I took upon myself the sacred task of sorting them all. Well I hope my daughter will one day appreciate the great work her Mama had done...My Amma sure did...for which I was very happy. I was able to file 3 big files with all Menus and a fancy Index too. It was quite a task. And the only dish that was repeated in all these files was this Channa Pulao. Curd Rice is a must for lunch and dinner, I just didn't take a shot of it. Hope you enjoyed my today's Lunch Box. Do send in your feedbacks.